Peter Drucker became my best friend the day he said something like this: “The three toughest jobs in the world are large church pastor, president of a small university, and school superintendent in a mid-sized town.” I’m one away from a trifecta of hard work. Thanks to all who have communicated with me about my new book on work. I wrote The Way We Work out of a conviction that the primary worship we offer to God is our work. How we work is a daily sacrifice of praise to the God who sustains us. It is a great exercise to end each work day with a prayer that says, “This is my offering to you, God.” Like Paul said to the Ephesians, we work for God. Work is also our primary witness. We honor God by the quality of our work. I cringe when somebody is lazy, unethical, and sub-par on the job but says, “Jesus” all day long. Just shut up and do your job well. Then you can add the Jesus label. Trevecca Nazarene University employees work on Labor Day. The odd academic calendar requires it so that students can go home earlier for Christmas. Here’s a salute to my friends who offer their worship to God via serving college students. They do great work. Wishing you a great Labor Day! I mowed my lawn this week. It was 92 degrees, humid, and sweaty. I have two lawn mowers – a push mower and a self-propelled, neither the kind you ride on. As a person who needs more exercise, I refuse to purchase a riding lawn mower. The grass forces me to work. And at the end of the weekly ritual there is something mysteriously sacred about the mown lawn. For all the work I do, this single ritual most acquaints me with God. I’m not sure why. My lawn mowing career began as a child at my grandparent’s home. They had beautiful Saint Augustine grass. It even sounds holy. And they owned an ancient lawn mower that had no motor. A twirling set of cutting blades spun round and round, equivalent to the speed with which it was being pushed. The faster you pushed it, the better it cut. Mowing their yard was a group exercise. With 27 cousins hanging around, we each pushed until we couldn’t breathe and then the next cousin took over. I cut my mowing teeth on that old mower. After 33 years as a pastor of a local church, I went over to the dark side of college administration and became a university president. After 10 years on the dark side, I look back at my old work and wonder what I would do differently. I think I know. Rather than trying to wrestle 10 volunteer hours from laity who had worked 50 hours that week, I’d invest in the quality of their 50 hours in the workplace. Rather than convincing them to energize the programs I was most invested in, I would energize the work God had given them to do in the world. Rather than measuring success as seating capacity on Sunday, I’d measure it as sending capacity on Monday. Yes, I’d still ask them to invest in youth and children, serve in the nursery, feed the hungry, visit the sick, and do all the things a mature body of Jesus does. But I’d view the mission of the local church as the way we served the community through our work. The gathered church occupies 5-10 hours a week at most. The scattered church lives shoulder-to-shoulder in the world 50-80 hours a week. As a gathered church, we are mostly among the found. As a scattered church, we are mostly among the lost. 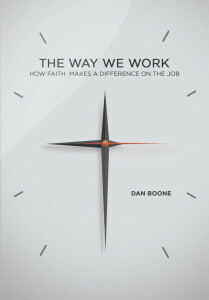 This conviction drove me to write The Way We Work: How Faith Makes a Difference on the Job . If I pastor again, these are the kinds of things I will say to people. You can purchase a copy, find out more, or read a few sample pages of my new book, The Way We Work, here. If you want to make promises that hard work yields great reward, Proverbs is the goldmine of texts. But it is not the only voice that speaks into the workplace. The Old Testament story of Job is a dissenting voice to wisdom. Job did everything he was supposed to do and lost it all. Some have suggested that Job was written as protest to the simplified proverbs promising that if we do “a” we will get “b.” Sometimes we do what is right and suffer for it. Job’s friends all had Ph.D.’s in wisdom but were declared by God to be dead wrong. Suffice it to say there is no divine guarantee that if we do the right things we will get the results we want. There is rogue suffering in our world. And sometimes our vocation finds us right in the middle of it. As Christians, it is our calling to participate with God in the formation of the world God imagines, desires, and wills. In other words, we do our work with the end in mind. We envision God’s desired future, and then return to the present to enact it through our work. We receive the kingdom of God into the present by our Godly work. We receive the kingdom of God into the present by our Godly work. If the kingdom of God is coming toward us from the future, we can be opened to receive it here and now as an expression of the reality of God’s in-breaking reign. This is how the ministry of Jesus is interpreted in the gospels. As Jesus speaks and heals and casts out demons, the kingdom of God comes among them. This is why we pray, “Thy kingdom come, Thy will be done.” It is the prayer that we might be the place where God’s future is being lived out. In the last post from my latest book, When Christians Clock In, we looked at what Ecclesiastes says about the reasons we work. Today, I want to talk about being remembered as a reason for work. In the human heart is the deep fear of being forgotten. Through our work, we are secretly hoping that we too will be remembered and will leave some evidence that we have mattered.